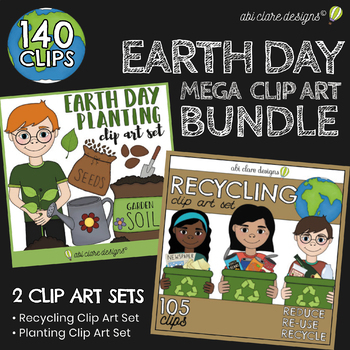 Save on this mega 2-set bundle of Earth Day clip art, including 150 unique clips. The clips are focused on the Three Rs of Earth Awareness: Reduce, Reuse, Recycle and planting and growing to save our planet. The bundle is diverse and versatile, and offers plenty of opportunity for educational, fun and interactive activities. The clips can be used for sorting, Earth Awareness printables, posters and instructional lessons to learn about planting and the process of growing plants/trees. - process of planting - from seed, to watering, to sapling, to sunshine, to tree. - ways to help our planet (saving electricity, reducing pollution, picking up litter) - best of all, lots of Earth-loving kids in action! - Earth Day kids with different skin tones. -PERSONAL USE: The clips have plenty of fun and useful purposes - creative documents, crafts, activities, storymaking and decorations - all to be used freely for your own personal and classroom non-commercial use. -COMMERCIAL USE: You may use these clips as part of products created and sold by you. By purchasing a clip art set - the clips are licensed to you, and only you - which means that they are not to be distributed or used in any place other than within your own products for sale. Any clips must be supplied in a secure format, so that the clips cannot be removed/extracted from the product. Credit is required: a link to Abi Clare Designs must be added to all products, for sale, that contain my designs.